A teacher stopped me as I was walking with my lunch and said, “I wish they served mashed potatoes with that.” You and me both! Mashed potatoes and corn is a beautiful pairing. My great-grandmother loved to mix mashed potatoes and corn together. I guess I got that from her. In my family mashed potatoes and corn would be served with roasted chicken or turkey. Delish! The “steak” was salty. And today I did not sop up the thin gravy with the bread because of my concerns about too much sodium. Do you ever cough when you eat something salty? I coughed a bit today over lunch. My lunch trash went into the classroom garbage can and when I came back into the room, it smelled overwhelmingly like the salisbury steak. A kid commented, “It smells like hamburger in here.” I opened another window. 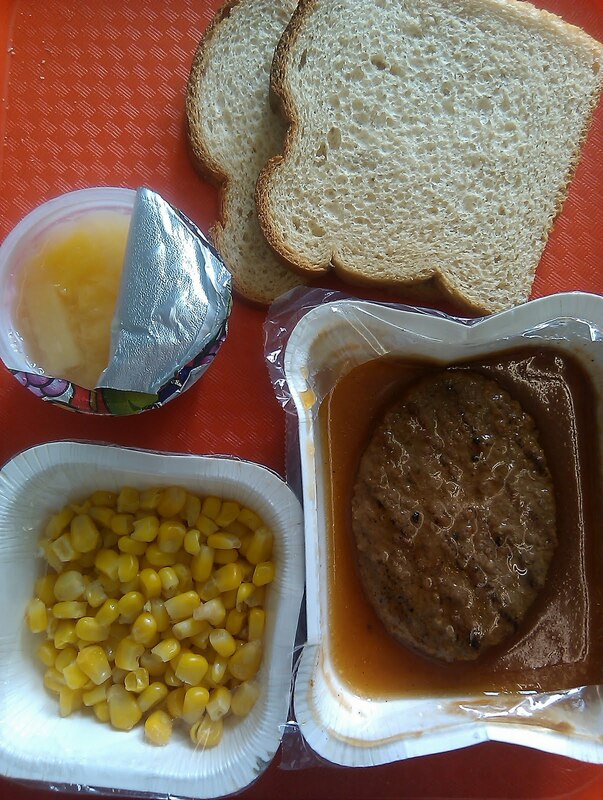 I also found out that the kids eat the salisbury steak by placing it in between the two pieces of bread and eating it like a sandwich. Makes sense to me, but I wonder if that’s how the creators of this meal envisioned it. Somehow I don’t think so. I am physically and mentally exhausted. I have been sick quite a lot this Spring, everyone in the family has been on antibiotics at least once, and I really need some rest over the summer. Not to mention wanting a little detox from the food. I’m finalizing my summer plans and I will be sharing some of them with you, but I decided I’m going the “volunteering” route. I had mentioned wanting to be a “lunch lady” over the summer, but I decided I didn’t want to get on anybody’s payroll and have a work schedule per se. What I really need is to rest after the grueling year I will soon be completing. So I’m going to do some volunteering with kids (and some food too), which gives me more flexibility on scheduling. I will be reporting on that over the summer. One of the reasons I came back to work after having a baby was that working a school year allows me to be a full-time mom in the summer. I’m really looking forward to doing all the things I put off doing during the school year. Zoo and museum trips, traveling to visit family all over, and just plain hanging out. Additionally, our budget can’t handle a summer of full-time childcare. Part-time is affordable, but I can’t stomach tons of childcare over the summer when what really is required is more Mommy-time. I need to rest up so that I can go back to eating school lunch in the Fall! I’m probably going to be in tears when I go back to work because I won’t want to eat the food. My mothers fresh mashed potatoes used to be a favorite comfort food of mine, so I have a particular and very pointed hatred of those damn potato flakes. Some people don't have enough time to put food in the microwave, let alone "boil and mash up potatoes". Talk about being close-minded. Ah, mashed potatoes. So easy, so good. I love to make them with red skin potatoes and even leave the skins on when they are being mashed. I used unsalted butter and skim milk and sea salt so they really aren't all that bad. I've even been known to grate some cheese and throw some in the potatoes and on top and broil the cheese on top just for a few minutes to produce an 'almost crust'. Pst, sour cream is divine too. I don't use the fat free because they put in crap when they take out the fat. I don't use fat free anything. i just use the full fat sparingly. Anyway, the steaks looks really bad. I think you are wise to take the summer off. Hope you enjoy! @Ann — if you don't have time to boil water, you need to have a close look at your life! Me close-minded? That's a little strong! If you (or anyone else who happens to read these comments) are ever in the Chicago area and looking for stuff to do, check this out. if you're looking for a place to volunteer, I'd suggest looking into Growing Power. i do a lot of work with them and have met Will Allen several times, and they've done a lot for the school I work with. Hm…I would have eaten it as a sandwich too. I love mashed potatoes! I love root vegetables in general. I didn't know about potato flakes. WOW. To Ann — "close-minded"??? Are you serious??? You don't have time to boil and mash potatoes??? And if you don't have time to put food in the microwave . . . what do you eat??? A great quantity of cold vegetables and cheese? I have often found that I can cook or even reheat something on the stovetop, in the oven or toaster oven, in the same amount of time it takes someone else to use a microwave. Hence, why I don't even OWN a microwave!!!! I believe you should re-examine your life and your schedule if you can't make a simple mashed potato dish on the stovetop. My darling beloved husband prefers the instant mashed potatoes to the real thing, which is so funny because he's quite the foodie. He served them to me once with leg of lamb, and called them "New World Mashed Potatoes". Mrs Q, I agree with your reply to Ann. I'm sure that people like that who say they have no time to boil potatoes and cook simple meals do find the time to watch TV and do other time-wasting activities. While I write this there are only 4 comments to your post but I bet there will soon be a whole lot of comments from all those people who will accuse you of being "elitist" because you dislike artificial potato flakes, as if disliking crappy non-food and wanting to eat real food makes one an elitist!! About the potatoes: I'm a convert. I am so sick of buying bad potatoes. I am unable to have a garden (we haul every drop of water we use & live in a very dry climate) so I am destined to buy from others. Potatoes are one of the biggest challenges. My family LOVES mashed potatoes. Imagine my excitement at the 13 year old's discovery of instant mashed potatoes at Costco?! Honest Earth (http://www.honestearthpotatoes.com/) is the brand & the ingredients are potatoes (including peel), butter, and sea salt. I can't beat the convenience (not of cooking, but of storage) and my family loves having potatoes whenever they like! Ann, if you're too busy to microwave food (YUCK! ), then you should probably examine your priorities. Ashley, good for you for using whole fat dairy! They add nasty stuff to skim milk too though. The best milk is raw milk! If your hubs really likes flake mashed potatoes, Idahoan makes a decent instant mashed potato. You can get them in foil packets that make about 4 cups worth finished. I keep them on hand for when I forget to plan ahead (or something I planned turns out to be a disaster). Real meals (as in, anything that takes more than 10 minutes to cook, like a roast chicken or meatloaf) gets real mashed potatoes, though. I know the salisbury steak looks horrible, but I'll bet it's not much worse than the bread if you checked both ingredients lists. Since I started reading labels I've been making whole grain wheat and rye beer bread (no kneading or rising, super quick and easy) and a bread machine is on my wishlist. I just can't bring myself to buy any of what's on the shelf, the local bakery is just as bad as the big boys, and I can't afford the freezer bread. the firs thing I thought when I read that you didn't eat the gravy with the bread was, "she doesn't use the bread to make it a sandwich?!" I guess it just seems natural to younger people. Mrs. Q, if you don't want to eat the meals, don't. Only my opinion, of course, but I think you could assist by writing about what to do to make changes, information about how your meal program reached this condition, what it would take to change it, how meal programs should be run, what menus should be served…that kind of thing. My grandmother taught me how to make the best mashed potatoes from scratch- and by from scratch, I mean getting them straight from the garden in the backyard. Nothing compares to that. The instant stuff? I won't even eat it. if there had been mashed potatoes, i would have called this lunch comfort food. is all of the lunch food starting to taste the same yet? Did you know that Many of the potato farmers will NOT eat the potatoes they grow for the masses. They have a field that they grow just for their own family. They do not use all the pesticides on That field. That said, potatoes are one of my favorite comfort foods. I have wonderful memories of my father and my oldest daughter planting potatoes in the garden together. The magic of watching a 5 year old help harvest those potatoes was amazing. We do use instant every once in a while. Not often. They just don't taste the same. I love potatoes in all forms, especially mashed potatoes, and usually keep several different kinds of potatoes in my basement. I also keep a box of potato flakes (just just dehydrated potato flakes; no additives) to use as an emergency thickener. They aren't my choice for mashed potatoes, but they will quickly thicken up any liquid that is too thin (or even mashed potatoes that have had too much liquid added). i cant stand potato flakes. Probably because I didn't grow up on them, we always had fresh mashed potatos. I tried them when I started living alone and making everything from scratch can be a waste for 1 person. I took one bite of the instant mashed potatos and I wiped the rest off and into the trash. I couldnt even finish the little bit I made. After reading Michael Pollan's The Botany of Desire, I got kind of scared of industrial potatoes. Apparently they use so many pesticides that eating young potatoes could do you quite a bit of harm –they have to be harvested after the pesticides have worked their way out of the potato –at least the super toxic levels have. He has an interesting description of what the potato fields look like. Of course, the fear faded and I now eat them again –I love potatoes. I keep telling myself I'm going to grow them soon. I'm going to grow them soon. Potatoes are really easy to grow. You can even grow them in a big bucket on a balcony. I can understand not growing them if you had to lug all your water in a dry climate though! You mentioned you want to be involved with kids and food this summer. Not sure if you have this program in your area, but here in NH in the inner city the gov't passes out breakfast, lunch AND dinner to kids all summer long. They have scheduled drop offs at city parks, pools and play grounds….. 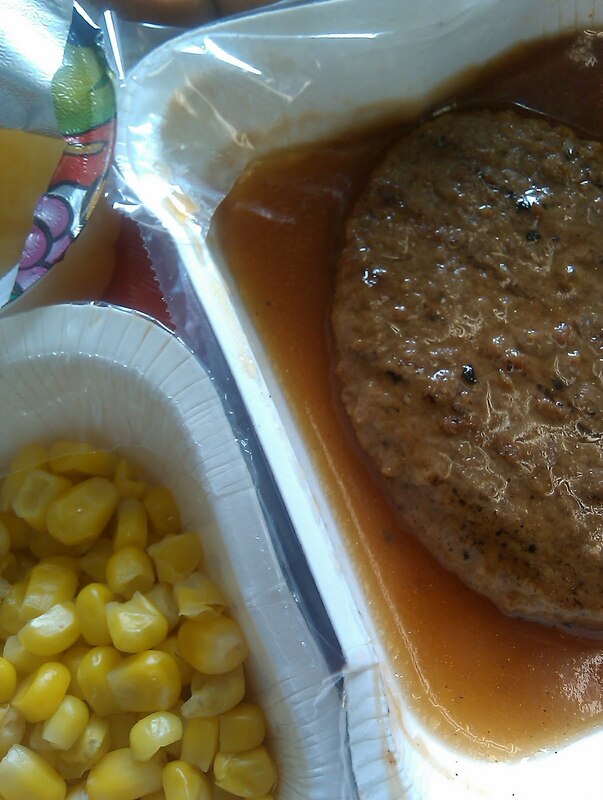 I probably would have eaten the salisbury steak as a sandwich, even if mashed potatoes were included. Mashed potato/potato salad sandwiches are delicious! I hate peeling potatoes, and my boyfriend refuses to eat the skins, so usually when we have mashed potatoes he peels them and I do the rest. Nothing beats homemade mashed potatoes. I do keep flakes on hand, though, mostly for baking; I actually have a loaf of potato bread rising as I type. You can use leftover mashed potatoes for just about everything you can use potato flakes for, but we rarely have leftovers. I agree with Maggie. If you aren't looking forward to school lunches next year, then why do it? You can continue the blog with more guests and updates on current trends and topics on school lunches. It sounds like you eat much healthier anyways and why sacrifice health? Just my opinion but I think your point was well made! Thanks for a great blog! Your comment several weeks ago re: volunteering w/ a summer food/school program is inspiring me. My church provides lunch 2 days/week for the children at a low-income apt complex (these kids are the ones on free lunch in school) so that they can count on a meal at least 2xs/week. Working around my interview schedule, I hope to volunteer w/ them a few days this summer. I use potato flakes to make my son homemade chicken nuggets (I pan fry them in canola oil). Sometimes it's better than the same old bread crumbs plus the texture is different. I mix in some parm cheese with the flakes along with a little onion powder. He seems to eat them every time (and he's a picky eater). I don't keep instant potatoes in the house, but I can see where they would help people out… especially as mentioned up thread, for making potato bread or thickening soup. The generic ones my mother always bought really were dreadful. They didn't stand up like good mashed potatoes, they just slumped onto the plate in a smooth puree… I'm sure if she had been interested enough, she could have fiddled with the water amounts to make them a bit stiffer, but she just doesn't care about food. I love potatoes of all varieties, especially mashed. And I like homemade as well as instant, though homemade is obviously best. But I have to say, you are definitely over simplifying the process of making mashed potatoes (though I agree calling you closed minded over it is a bit much). It's a lot more than just boiling water! How about peeling and cutting the potatoes? That can be pretty time consuming. Well worth it, but still time consuming. I can see why people would have instant over homemade in a time crunch. I also don't think it's fair to say that people who don't have time make mashed potatoes from scratch need to reexamine their priorities. You have no idea what goes in other people's lives. If a family has a busy night of activities after school that takes up most of the evening (like one kid has some kind of practice, another has some kind of game, and so on and so forth), but the parents still want to provide a good homemade meal, aren't instant mashed potatoes at least better than fast food? At least they're still made out of actual potatoes! People on here are so damned judgmental. It gets annoying. Instant Mash was developed for camping and backpacking, and the do taste amazing after a long day of hiking. Indoors, I eat them from time to time when I don't have time for scrubbing, peeling (I know I could leave them but I don't like them), cutting boiling, mixing and mashing. Instant potatoes are definitely more convenient but they don't taste as good. Plus, with how I doctor my real mashed potatoes, the instant are much healthier for a regular staple. Mrs. Q. – Shame on you. Berating Ann for not having time, is like berating someone for not having money. She may be a single working mother, she may have a spouse with cancer, she may be caring for a parent with Alzheimers or maybe after getting up at 5:30 in the morning and getting her kids up and dressed and herself ready for work and dropping her kids off at school, a full day at work, a long commute home, going to the little league game her daughter is in that night and getting home at 7 facing making dinner for the family, picking up the house, doing a couple loads of laundry, helping with homework —- maybe she doesn't have the ENERGY/time to peel potatoes and make mashed potatoes from scratch. You have no idea what goes on in other people's lives. That's awesome that your life is so wonderful. Maybe a little less judgement about people who are going through stressful times is in order. "I wonder if that's how the creators of this meal envisioned it." – I love that! I envision some person in a room with binders of USDA rules, thinking up these "menus." I get the sense that this person probably doesn't envision or care how the meal goes together and how students should eat it. These meals look like they were fed through a computerized random number generator. And no, we don't know what Ann's life is like. She might have to work 3 low-wage jobs just to stay afloat. Some people just don't have the luxury of time. Time is a very precious resource. Everyone could benefit by auditing their schedule to make sure they aren't wasting any. Mrs Q, enjoy your "mommy time" with your kids while they are very small. Once they get to school their vacations will be accompanied by math worksheet, summer reading lists, reports assigned the last day before Christmas break and due the first day back, or 40 hours as week of band or sports practice throughout August. Several of my friends and I agreed that we were amazed when we got to college at how much spare time we had. By the way, those of you who hate instant mashed potatoes are probably following the recipe on the box. These directions are designed to make users think the potatoes are extremely cheap. Instead of 2/3 c. milk and 1 1/3 water, or whatever, try using all milk or half milk and half water. Increase the margarine or oil you use, also (being sure to use a low-fat kind). Add a bit more milk or more flakes if they aren't the consistency you like. You won't be able to tell the difference from "real" mashed potatoes, except by the absence of lumps in the instant ones! And if you're family is into flavors, throw in a little minced garlic or garlic powder.